The technique for the development of potato flour from the potato variety ‘Kufri Badshah’ was standardized in the laboratory. Five products viz sevian, doughnuts, vadi, cutlet and kofta were developed by incorporating potato flour, defatted soy flour and corn flour in various proportions. Frying and fermentation were the major processing techniques employed for the development of these products. Protein, ash and fat contents of potato flour were almost similar to those of raw potatoes. Significant differences in protein, ash and fat contents of all the products were observed. 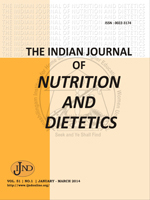 Protein and starch digestibility and mineral availability of potato flour was significantly higher than that of raw potatoes. Protein digestibility increased 13-16 % on frying and 25 % on fermentation of products. Starch digestibility was increased by 17-19 % on frying and 33 % on fermentation. Processing significantly increased mineral availability. Frying increased calcium availability by 19.45 to 20.51% and iron availability by 19 to 21.52 %. Fermentation increased calcium and iron availability by 34%. Processed products had significantly higher protein digestibility, starch digestibility and mineral availability compared to their raw products. Thus, it can be concluded that frying and fermentation are effective methods of improving starch and protein digestibilities and mineral availability of products. Frying, Fermentation, Corn Flour, Defatted Soy Flour, Protein and Starch Digestibility, Mineral Availability.